Why Do GOP Bosses Fear Ron Paul? Paul’s criticisms of military interventionism and crony capitalism scare the establishment, but grassroots Republicans are intrigued by his old-fashioned conservatism. 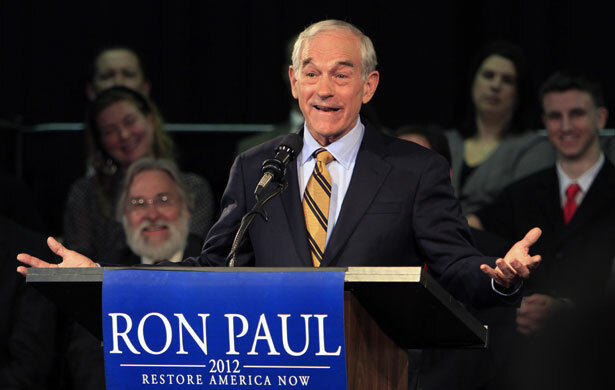 DUBUQUE: Ron Paul represents the ideology that Republican insiders most fear: conservatism. Not the corrupt, inside-the-beltway construct that goes by that name, but actual conservatism. And if he wins the Iowa Republican Caucus vote on January 3—a real, though far from certain, prospect—the party bosses will have to do everything in their power to prevent Paul from reasserting the values of the “old-right” Republicans who once stood, steadily and without apology, in opposition to wars of whim and assaults on individual liberty. Actually, Paul’s notion of foreign policy is in line with that of conservatives used to believe. The congressman is often referred to as a libertarian, and he has certainly toiled some in that ideological vineyard. But the truth is that his politics descend directly from those of former Ohio Senator Robert “Mr. Republican” Taft and former Nebraska Congressman Howard Buffett—old-right opponents of war and empire who served in the Congress in the 1940s and 1950s and who, in Taft’s case, mounted credible bids for the party’s presidential nomination in 1940, 1948 and finally in 1952. In all three campaigns, Taft opposed what he described as the “Eastern establishment” of the party—the Wall Streeters who, he pointedly noted, had little in common with Main Streeters. “The maintenance of the right of criticism in the long run will do the country…more good than it will do the enemy,” explained Taft, who challenged President Truman’s attempts to use war powers as an excuse to seize domestic industries and otherwise expand what Dwight Eisenhower would eventually define as the military-industrial complex. Buffett campaigned in 1952 to nominate Taft as the Republican candidate for president. That effort was opposed by the Wall Street speculators and banksters of the day, and it failed—although not without a serious fight that went all the way to the GOP convention. That was the pure voice of old-right conservatism speaking. It is echoed now by Ron Paul, who makes no secret of his high regard for Taft, Buffett and the old-right Republicans of the past, and of his disregard for the neocons and crony capitalists of today. Paul is running ads that propose to “drain the swamp,” a reference to the insider-driven politics of a Washington where Republicans such as Gingrich maintain the sort of pay-to-play politics that empties the federal treasury into the accounts of campaign donors and sleazy government contractors. Paul’s ideological clarity scares the wits out of the Republican mandarins who peddle the fantasy that the interventionism, the assaults on civil liberties and the partnerships that they have forged with multinational corporations and foreign dictators represent anything akin to true conservatism. The problem that Limbaugh, Hannity and other GOP establishment types have with Paul is that the Texan really is a conservative, rather than a neoconservative or a crony capitalist who would use the state to maintain monopolies at home and via corrupt international trade deals. Paul’s pure conservatism puts him at odds with a party establishment that has sold out to Wall Street and multinational corporations. But it has mad an increasingly iconic Republican with a good many of the grassroots activists who will attend the caucuss. The disconnect between the disdain the establishment expresses with regard to Paul and his appeal to the base is easily explained. The GOP establishment chooses partisanship over principle. The base does not necessarily do so. In other words, while the party establishment and its media echo chamber reject the Main Street conservatism of the Taft’s and Buffetts, there are many grassroots Republicans in Iowa towns like Independence and Liberty Center (where Paul campaign signs are very much in evidence) who find Paul’s old-right conservatism quite appealing. That is what frightens Republican party leaders. The notion that the Grand Old Party might actually base its politics on values, as opposd to pay-to-play deal-making, unsettles the Republican leaders who back only contenders who have been pre-approved by the Wall Street speculators, banksters and corporate CEOs who pay the party’s tab—and kindly pick up some of the bills for the Democrats, as well. What do the party insiders fear about genuine conservatism? Above all, they fear that a politics of principle might expose the fact that the Republican Party has for decades been at odds with the conservative values and ideals of Americans who do not want theirs to be a warrior nation that disregards civil liberties and domestic economics in order to promote Wall Street’s globalization agenda. Ron Paul is not a progressive. He takes stands on abortion rights and a number of other issues that disqualify him from consideration by social moderates and liberals, and his stances on Social Security, Medicare, Medicaid and labor rights (like those of the author of the Taft-Hartley Act) are anathema to economic justice advocates. But Paul cannot be dismissed as just another robotic Republican. Indeed, he is more inclined to challenge Republican orthodoxy on a host of foreign and fiscal policy issues than Barack Obama. He does so as something that is rare indeed at the highest levels of American politics: a conservative. And if he wins Iowa, he could begin a process of transforming the Republican Party into a conservative party. That scares the Republican bosses who currently maintain the party concession on behalf of the Wall Streeters. But it, if the polls are to be believed, it quite intrigues the folks on Main Street who may be waking up to the fact that the “conservatism” of a Newt Gingrich or a Mitt Romney is a sham argument designed to make the rich richer and to make the rest of us pay for wars of whim and crony-capitalist corruption. * John Nichols is the author of several books that examine the legacy of old-right conservatives such as Taft and Buffett, including: Against the Beast: A Documentary History of American Opposition to Empire (Nation Books).